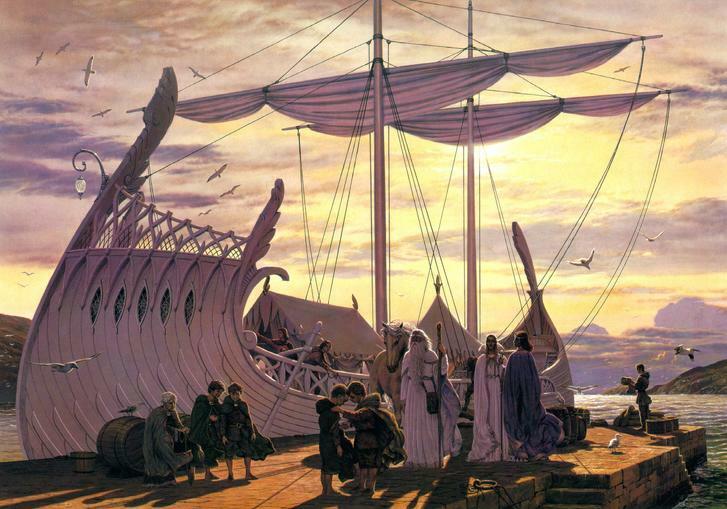 Of course, that is Tolkien’s mythic tale, but it echoes a sense of the world that surrounded his generation. Like Lewis, he was a veteran of the Great War (WWI), where soldiers first encountered the nightmarish horrors of modern warfare. Battles of that war sometimes left the dead numbering in the ten’s of thousands. It surprised even its generals. And with the advent of such horrors, what remaining innocence that preceded the war (and there was an abundance) simply disappeared. 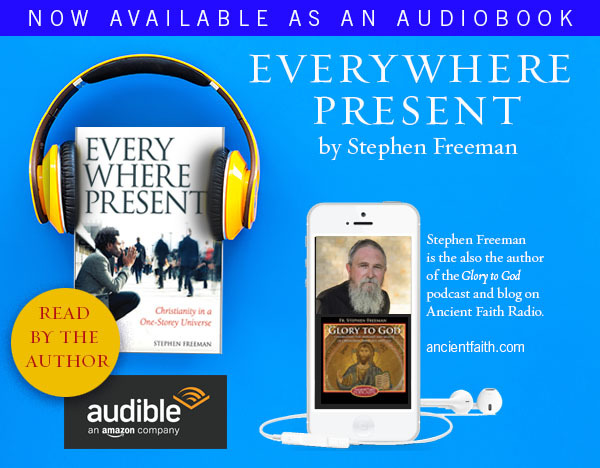 Father Stephen…what a beautiful and insightful post….thank you!!! I can’t remember if you allow links here, but this is a blog article I wrote on similar themes, in part inspired by your interest in Barfield. It is incredibly easy to lose one’s enchantment with the world in today’s modern age. I have struggled for the last decade to hold onto, and develop, that sense, but I only catch glimpses of it from time to time. The other night, as I was walking to the grocery store for a late evening errand, I noticed Venus hovering over the yellow glow of the just-set sun. It’s been a long time since I’ve looked to the sky and considered the majesty of the sight, but for whatever reason, I was struck by a thought that often came to me in college: there was the fullness of astronomical distance between a planet and the Sun. I could see, from my place on this small planet, 67 million miles clearly laid out in the sky. And Venus looked so small and insignificant, a small pinpoint of light; how much less significant must Earth look, half again as far from the Sun as Venus! It’s a hard thing to put into words, and I’m not sure that anyone reading this will understand what the precise thought I’m trying to capture is, but it’s one that fills me with awe. It’s perhaps easy for us to look at that sight through the lens of disenchantment, but every time I consider what my eyes are actually perceiving, I am reduced to fear and trembling and I know that there is a God greater than anything I can conceive in my own little mind. After posting, it seems I may have missed the most incredible part of your article. I wonder if you have written on this before, or if others have? Correct me if I’m wrong, but what you seem to be saying is this: that, in some way, the vision of Venus and its distance from the Sun I described above is precisely what willingly died on the Cross. This is an excellent reflection. I, too, have struggled with the disenchantment of the modern world. Of course, I want to believe in the magical, sacramental world, but it is very difficult to do when one is surrounded by strip malls, big box stores, and concrete. The moments I feel most the sacramentality of the world are when I am furthest to what we would call civilization—that is, when I am surrounded by what God has created and not modern man. Anyway, I agree that the antidote is thanksgiving. One author that helps me see everything as a miracle, as a gift, is G.K. Chesterton. His writing is filled with the exuberance of humble praise, for he realized that existence itself is a shocking gift, an act of God’s gratuitous mercy. And he could not help but be happy at the thought. “It is commonly in a somewhat cynical sense that men have said, ‘Blessed is he that expecteth nothing, for he shall not be disappointed’. It was in a wholly happy and enthusiastic sense that St. Francis said. ‘Blessed is he who expecteth nothing, for he shall enjoy everything.’ It was by this deliberate idea of starting from zero, from the dark nothingness of his own deserts, that he did come to enjoy even earthly things as few people have enjoyed them; and they are in themselves the best working example of the idea. For there is no way in which a man can earn a star or deserve a sunset…. So arises out of this almost nihilistic abyss the noble thing that is called Praise; which no one will ever understand while he identifies it with nature-worship or pantheistic optimism. When we say that a poet praises the whole creation, we commonly mean only that he praises the whole cosmos. But this sort of poet does really praise creation, in the sense of the act of creation. He praises the passage or transition from nonentity to entity; there falls here also the shadow of that archetypal image of the bridge, which has given to the priest his archaic and mysterious name. I’ve linked an excellent discussion between Rabbi Sacks and Charles Taylor on enchantment. Weber’s statement is the launching point for the discussion. Welp it was supposed to be linked. Here it is. I have recently been teaching the Jesus prayer in my parish. As we are finding the greatest hindrance in our prayers is the disenchantment of our imagination – failing faith as failing eyesight loses touch with the Knoweldge of the One in whom we live and move and have our being. I still see shimmers of this enchantment in the writers of fiction (primarily science fiction and fantasy) today. Granted, there’s a lot of dystopic nihilism out there, and the popularity of post-apocalyptic fiction is probably significant. But I’m thinking primarily of Catholic authors like Gene Wolfe (whose Book of the Long Sun is one of the most compelling works of contemporary science fiction with religious depth out there) or the creators of animation like Hayao Miyazaki. I think there is a generation of readers and writers who craves this “re-enchantment” and finds echoes of it in even contemporary fiction. When I first read that it was if my eyes were open to the reality of God everywhere present and filling all things, many years before we came into the Orthodox Christian Church where I am reminded frequently through the church and through the fathers, like St. Nikolai quoted above here in the comments. I really never associated this train of thought with magic or elves or fairies because I associate them with Santa Claus and not with St. Nicholas — does that make sense? Also we lived in Denmark for awhile and were able to travel some around Scandinavia where the nisse (tomte or “elves”) — good and bad — have a real reputation for good and ill, and this folklore never reminded me of the presence of God as much as the beauty of the land in those countries. I know of what you are saying and have book marked a website–http://apod.nasa.gov/apod/astropix.html– and access it daily for the same wonder and enchantment you described in viewing Venus. Yes, fear and trembling but also humbling wonder and awe at the magnificence of our God that has created this incomprehensible magnitude of such power and beauty. Truly an enchantment. Barfield’s concept of “Original Participation” is linked to that understanding of language you described. It is, on a certain level, a One-Storey Universe. Although Barfield thought that the evolution of language inherently created a distance from the things of which it spoke. Tolkien played with this for many years in the Silmarillion/LOTR, etc. The evolution of words and what it meant. I’ve never quite made my own mind up on it. My own thoughts have been more influenced by meditation on the Hebrew “Dabar” (word, event, thing, etc.) and its many derivatives. It parallels the Greek “Logos” but with many Hebraic twists that yield even yet new insights. In that sense, I would think that only God ever spoke the true name for anything. And in Orthodox thought that the true name of something is its logos, all of which are summed up in the Logos, the original word for everything that is (all things were created through Him). If we loose the ability to wonder in awe live only in a utilitarian universe, stark and denuded and the seduction of nothingness becomes more powerful. To play with your children or your spouse (not competitive play) or to just sit in awe-struck silence in the face of a flower or something else of beauty in creation. These are antidotes. Laughter, simply for the sake of laughter. The night sky as has been mentioned. Father, it is indeed sad that your 9 year old was so certain that fairies did not exist. I’m 66 and I am mesmerized by the possibility of fairies at times. Enchanted still with Midsummer Night’s Dream: Puck, Oberon, Titania and all of the assorted sprites is but one example. What a beautiful and truthful reflection. When I read fantasy literature, I have often been struck by echoes of Orthodoxy. E.g., the magical portraits in Harry Potter are echoes of the miracle reported of St. Mercurius’ icon. St. Porphyrius could fly, though we wonder without delight that Professor Snape and Tom Riddle do, too. Elvish singing affected Frodo the same way that good monastic chants affect me. The Black Riders act like demons. More generally, solid Orthodox hagiography sparkles with wonders. The needs that were once upon a time in my two-storey universe were met by fantasy and science fiction have long since been sated by the lives of the saints. Every attempt to return to the past, has only ever succeeded in creating something new. There is no going back to the enchanted worldview of the middle ages. 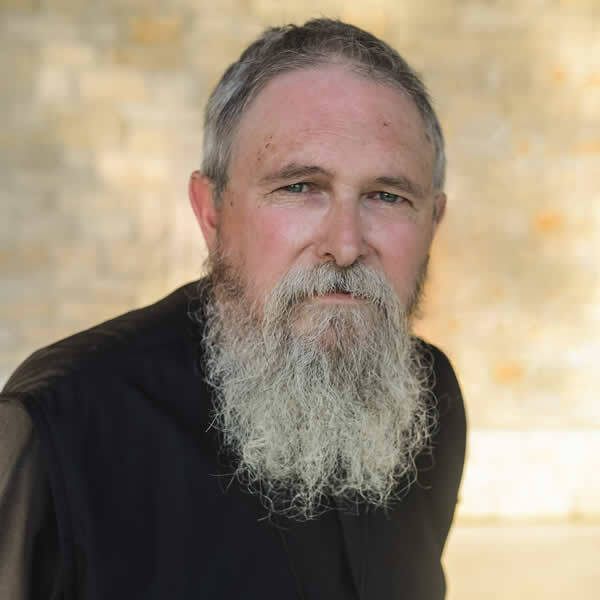 I do not think Fr Stephen is advocating this, but I have met many Orthodox who seem to. There is a danger that Orthodoxy becomes a new form of escapism, a retreat from the world, not in where we live, but in our minds; the very world which ‘God so loved’. A new kind of enchantment is, perhaps, possible, but that will require courage and creativity. If we are to find our way to a new land of enchantment I think this will demand fidelity to our spiritual heritage and to the world as it actually is, not as we would like it to be. The modern age has given us science and a fuller understanding of the physical world in which we inescapably live and which God did make. We do better understand the workings of creation. And perhaps future generations will look on our understanding of it and relationship too it as things of faeries also. Much of the enchantment of ages past was only made possible by and was the direct result of the ‘science’ of that age, totally appropriate given the degree of knowledge concerning nature at that time. We must live and think appropriately to our knowledge of the world. Otherwise do we not risk inauthenticity, having a faith which deceives itself? Just as modern science has shattered, or at least has seemingly shattered, our fairyland, Christianity did the same to paganism. Look into the accounts of saint-missionaries in pagan lands, in the hagiographic accounts of early saints or the ancient writings of apologists and you will find Christians berating the pagans for their superstitions, and working to set the masses free from false beliefs about the world and the God who made it. Or look at the creation account in Genesis which apologetically exclaims, that the stars are not gods, the sun and moon are not gods, the animals of the sea, of the land, and of the air are not gods. They are made by God. With the advent of Christianity the faeries and elves went into hiding. They retreated to lonely places. Its like some bad Christmas movie where Santa’s sleigh cannot fly because not enough boys and girls believe in him, except in this version the fat bearded elf doesn’t find a way to get his reindeer off the ground and cannot restore Christmas spirit. However, the world is still full of wonder, just not as our forebearers once believed. Science has solved old mysteries, but many remain and the new ones are far darker, their fog thicker. The mysteries of the universe are bigger than any previous generations ever imagined. Who could in fact imagine black holes, quasars, quarks, space travel, nano-tech, organ transplants, vacinees? And who would imagine the problems and questions which have arise as a result? Louis C.K. when on Conan O’Brien gave a humours and yet profoundly insightful commentary on our lack of wonder. Humor is an awesome vehicle for truth. Check it out here: https://www.youtube.com/watch?v=uEY58fiSK8E . It is titled “Everything’s amazing and nobody’s happy.” We partake of the miracle of human flight and we talk on invisible signals which go to space? We do magic every day. We are casting spells all the time! I think Fr Stephen is right, the problem is not the world or our science, but our hearts which so easily slip out of wonderment and into boredom. These new discoveries have given us new and bigger mysteries. For all our answers we have now have more questions than ever. And they have opened up more wonderful things about the world in which we exist. And if our world is only a fraction as amazing as our God than ought not our amazement and wonder at the divine be greater than ever? Science and modernity need not be our enemy. We have more to wonder at today than ever. We have things around us more wonderful than faeries. Interesting to hear Jonathan Sacks’ observation (in linked video above) that Weber’s Entzauberung has its roots in Genesis 1. That with the litany of “and God said” and “there was”, the demythologizing of the creation narrative for the Jewish and Greek worlds began, and with it, both secularization and the placing of God as a wholly transcendent being. “There is no going back to the enchanted worldview of the middle ages.” Yet the first two considerable poets after the English break with Catholicism sought to do exactly that–Spenser and Shakespeare. In spite of the very pious, Protestant intentions they both projected, they were too wise to look for enchantment in the Reformation worldview. Indeed. In some parts of the English world, the Reformation was a slow take. Shakespeare clearly didn’t like Puritans (I worry about those who do). Many things died a slow death, and some are still around. My mother’s family had many who still practiced various kinds of folk medicine. My grandmother could “stop blood” and “talk fire out of a burn.” My greatgrandfather “removed warts.” These were old Celtic folk practices that were Christianized (they always said it was done “by Scripture”), but had a very magical aspect to it. My Mother could occasionally be the most secular person I knew, and in the next moment an old Druid. You just had to ask the right question. I live in Appalachia, the area of the US settled by the Scots-Irish. There are many old folkways still in existence, and I treasure our local dialects. The Protestantism of the backwoods is quite different than you would expect. When I was a hospice chaplain for 2 years out in the mountain areas, almost every rural home (Baptist or Pentecostal) would have pictures of Jesus. The Sacred Heart was quite popular. One home even had a statue of Mary in a young woman’s room (about 3 feet tall!). To be fair, they also frequently had pictures of Elvis – often hung just next to Jesus. I’ve seen rural mountain Churches (Baptist) with as many pictures as an Orthodox Church has icons. The instincts (when not crushed by a tutored Protestantism) revert to something deeper and more native. I often felt I was among “anonymous Orthodox” – to play with a phrase of Rahner’s. There is also a bit of native American (Cherokee) lore hereabouts as well – though quite Christianized. A fair amount of this can be seen in burial customs in the mountains. Secularism seems to be terribly artificial and boring – and one of the least human ways of living. We’re a sad lot – we moderns. A pastor friend defended his family’s observance of the ruse of the visit of Santa Claus at Christmas (complete with sooty footprints coming from the fireplace) for his young children by explaining he wanted to inculcate in them this capacity for a sense of wonder. Similarly, an elderly Baptist friend recounted experiencing a loss of faith in the wake of his mother’s untimely death when he was a boy and, shortly after that, his discovery before Christmas of some wrapped gifts hidden in his grandparents’ house shattered his belief in Santa as well. He movingly described how his grandparents’ elaborate staging of a visit from Santa Christmas eve on their farm (complete with sled tracks in the snow) renewed his capacity for faith in both Santa and God even though his grandparents were not themselves believers. Interesting how this modern commercial cultural tradition, rooted obliquely in one of the greatest Saints of the Church, remains one of the few occasions for enchantment (at least for children) in the modern world. We moderns do indeed inhabit a sadly disenchanted world. Fr. Stephen, for what it’s worth, your writings have helped re-enchant the world for me, or rather awoken me to the enchantment which is already there. I still at times cling to old patterns of thinking, but I surely appreciate the nudging and the reminders, most especially when it can be easy to go through day to day life encountering nothing but the opposite. Re: Can the world, once disenchanted, ever be restored to its former wonder? Do you think we have “Naaman, the leper” complex? Will the “enchantment” return when we find we can be cured by something so ordinary as bread, wine, water, etc.? Thank you for your “wonderful” articles! Can the world ever be restored to its former wonder? Yes. One heart at a time. The world hasn’t changed. Only hearts have. True enchantment is not about the past at all. True enchantment is recognizing the pregnant moment in awe, wonder and child-like amazement, amusement and acceptance of joy. It is not created so much as simply recognized. Fr. Matthew is correct in that we can’t simply re-use old symbols of enchantment although we can certainly feed our own sense of that gossamer state by reading and appreciating such stories and poetry and their connection to God. Enchantment is a challenge to the material and analytic mind’s passion to explain and control everything. It is a recognition of the incredible fecundity in the creation that goes on a pace with or without me. In Orthodox terms it is a calling to move in the direction of being fools for Christ. I have a picture of the Elder Sophrony on my computer in which he looks a great deal like a joyous elf full of wise mischief, blessing and peace. First of all, I want to thank Father for doing that post. As a young person, the “New Anthropology” surrounds me always. I accept the Church’s teaching on sexuality out of faith and obedience; understanding is much harder to come by. My question/request it this: can you do a post or series of posts on “What is marriage?” I read you and other commentators talking about “mystery”, “fulfillment”, “union”–but none of the marriages I know about are like that! Most of the marriages in my family (and my parent’s marriage) are about the stronger-personality party (the wife) exploiting and domineering the stronger-economically party (the husband), and the stronger-economically party passively-agressively manipulating the stronger-personality party. This pattern has been punctuated by a few marriages in which the stronger-economically & physically party (the husband) has physically and economically abused the generally-weaker party (the wife). And this is among the relatives with “stable” single marriages who proclaim “traditional” values–not the ones who have been divorced and remarried 3-5 times! So when you or other commentators start talking about the ontological union of Male and Female, or the Mystical Union of Christ and His Church, etcetera, etcetera…it is meaningless to me. And I think that perhaps I am not the only one. With my brain, I can grasp a definition of marriage that is a very weak (easily broken) civil contract that enables you to file your taxes jointly and automatically inherit an estate without further tedious paperwork. I don’t think the Church cares about such silliness. But what else is there? Maybe my question is not so far from this post after all. When I look at marriage, it is “disenchanted”. The *best* I see it as is a standardized legal contract. (The worst is as a social game that allows various parties to manipulate, exploit, and triangulate against one another.) What else is there? That’s a very good question. I’d love to see such a post from Father Stephen as well. I hear what you are saying. I can point to some awful marriages in my family, among my friends/acquaintances, etc. In a way, they hardly even rise to the level of “contract” because at least in a contract there is an implied sense of duty, respect, and some basic level of trust of the other party, otherwise you would not enter into it. In my own marriage (lets see, 18 years now) which I asses to be “strong” these elements of sin: manipulation, resentment, exploitation etc. are there, that is just a fact. That is of course because I am a sinner, and bring my sloth, narcissistic demand for comfort, pride, etc. to the relationship. I am generally also quite emotionally “numb” and insensitive, so I don’t “read” our relationship as well as I should. This all adds up to a very imperfect slog through the valley of marriage. That said, love is greater than all this. To the extant that my wife and I can and do reflect Love, that is the extant that our marriage is in fact all that the Church says it should be. And believe it or not, it really is all those things – At our best, we really are a “Holy Union”. If I thought for a second that it never rose above a “contract” then I would have given up long ago. In the end, one needs to simply trust God and His Church, follow her prescriptions for a good marriage, and most of all continually examine and correct oneself. Otherwise, like you note, one can be a “traditionalist” or a “christian” and talk the talk, but in no way walk the walk. Is that not probably the most tragic thing of all, to “intellectually” affirm the right, and to in fact (in your heart and thus in your behavior) follow the demonic, the selfish and conflicted road. Lord have mercy! Also, even those bad marriages which you are all to familiar with, you have to remember that God is working there also, just in ways that are hidden. When I think of some of the bad marriages that I am familiar with, and I start to think at what these people would be like if their will was not in some way checked by the marriage, I realize that these people could be allot worse off spiritually, etc. That is not always the case of course. You talk about your obedience and faith. I commend you for that, because I think about how often I have thought I was wiser than the Faith – the times that it just does not make sense or seems flat out wrong, and then after a while (sometimes a long while) I come to learn the wisdom of it and the failing of my own “reasoning” or “feelings”. As far as the “New Anthropology”, our Church will need to do a better job than it is currently in bolstering yours and mine “understanding” of the real truth of mankind. I believe it is a failure of leadership (can’t say more without running afoul of the rules of this blog), though even with a perfect response the cultural pressure is really, really against us. We need to support the efforts of Fr. Stephen and others who with no small amount of bravery take the issue head on. Enchantment comes from seeing things as they are in God’s economy and not the way we want them to be or what the world says they are. The enchantment of marriage is certainly one of those. An example of real enchantment from recent news: The young child who was saved by rescuers who heard a female voice coming from the car in which the child was hanging upside down in her car seat in frigid weather and had been for hours. Her mother was killed in the crash but I’ll bet you a whole lot that it was the mother’s voice that the rescuers heard and it was the ‘dead’ mother who somehow managed to keep her babe from freezing to death until the she was rescued. Several rescuers heard the ‘voice’ none can explain it because they are disenchanted. As my priest is fond of saving: Love finds a way. Love wins. Corruption and death are overcome. As Father Stephen says often: Christ came not to make bad men good, but dead men live. Disenchantment is the product of not recognizing the life all around us and in us; the fecundity of that life that can be experienced and participated in if we open our hearts and our minds to the source and giver of that life and fecundity. The Incarnation demands such care. Mystery does not mean mysterious or unreal or ethereal. It simply means that there are great depths which we poor created folk can only experience by being brought into them by the grace of God. Even then there is always more. By our own efforts we can do nothing. I have thought about this article for a few days before responding. My humble experience has been that once I started looking for God in my everyday life, and expecting Him to be there, I found Him in all sorts of places, both expected and unexpected. Once we begin to look to God for our provision, and to look for how He answers, we will begin to be enchanted by how he guides our life. Reading this touched off a recurring fear I have that my son, who is now about the same age as your fairy-doubting daughter was on you forest walk, is growing up with no sense of wonder about the world. I never had that problem — I think, because I spent a good bit of my childhood and young adulthood in some very remote (i.e. from civilization) areas: an empty corner of Oregon, a Wyoming desert, the Cascade mountains. And needless to say, there was no smartphone or iPad to keep me grounded to “reality.” I spent hours wandering rivers with my fishing pole, alone – or, rather, by myself. For anyone who’s spent good chunks of time in this way, there can be no talk of disenchantment. It’s the life of the psalmist and sadly it’s disappearing fast. Two obvious examples came to mind as I read your post. One was the dwarves in The Last Battle who could see nothing but a dirty stable. The other has been snatched back by my modern mind already. But it does make me think of C.S. Lewis once saying that miracles only happen to those who believe in them. It is a recent but growing realization to me that a polarization eventually happens: either we end up believing that all of life is a miracle…or that none of it is. While I still disagree with a few of your points I do apologize in that I obviously misread your post. I spoke in haste and falsely accused you. God forgives us all. I should have been less critical and more kind in my portrayal. What is most sad has been the modern treatment of the liturgy. It’s heartbreaking sometimes.